The publishing industry is in a massive spin right now with the major houses being challenged by the influx of self-published authors contesting their own titles on bookstore shelves. Of course, a great deal of this has been fuelled by online digital publishing, which has made self-publishing far more accessible. Inevitably, this revolution has both positive and negative implications for the industry with some books being released clearly being below standard. This makes sense when one considers that a self-published author must source their own editors and graphic designers before working independently (and tirelessly) to promote the title without the usual connections that the traditional publishing houses have. However, at the other side of the spectrum, self-publishing, has launched the careers of many emerging authors. I often think of Hugh Howey and his highly successful “Wool” series, which gained him great acclaim (and greater financial rewards than he may have received had he gone the traditional route). However, this post is not on the topic of the publishing revolution. 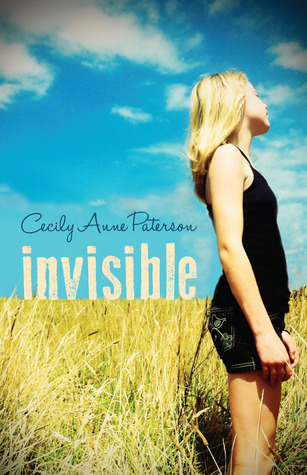 Rather, I wanted to explain my mixed emotions upon receiving a copy of Cecily Anne Paterson’s self-published YA Contemporary Invisible. First impressions count with me, although, as any English teacher will tell you; they count even more as far as young people are concerned, and it doesn’t matter how many times we tell them not to judge a book by its cover they still do! Paterson’s novel is beautifully packaged, both digitally and in hard copy, with a savvy cover that will appeal to the most discerning adolescent reader. In fact, this professional approach extends beyond the cover to a story that is meticulously edited to industry standard. From this point I want to forget that this is a self-published title because if I didn’t look too closely I would never have known. Invisible tells the story of middle school student Jazmine Crawford. Jazmine has perfected the art of disappearing into the crowd, a skill she mastered after the death of her father when she was nine and the constant moving from town to town that followed. She also lives with a disability, partial hearing loss, which conveniently allows her to withdraw even further. When Jazmine gets into trouble at school she is forced to participate in the school production of The Secret Garden and she can no longer disappear into the background but must learn to tackle her problems head on as she confronts her own Goliath in the form of the school bully Shalini. Invisible explores the key themes of bereavement and loss, bullying, living with disability and to a lesser extent the impact of depression. This is a classic coming of age story about the desire to belong and will appeal to readers in the lower end of the middle years. With a range of pertinent themes and language that is well crafted, Invisible would be an excellent choice for shared class reading, with the story working well as an introductory text for students new to High School (Grade 7 or 8 depending on the state or school you teach in). It would pair well with Steven Herrick’s Bleakboy and Hunter Stand Out in the Rain or similar and will work well when used in reading circles or independent study. Jazmine is a convincing character whose lack of self-certainty is as relatable as her personal growth is refreshing. In fact, I only had one very small gripe with the story; a group of students were suspended from school for 3 weeks! The teacher in me felt this to be a little severe even for a serious crime. A small thing really and I wonder if an interesting debate on this punishment might follow a class reading of this. Invisible is sensitively written story that will appeal to a broad range of readers in the lower middle years. A title well worth the extra effort to locate and place it on your school library shelves. Too often it feels as though we are quick to judge and swift to run the emerging generation down. Young people are misunderstood with claims that they are too self-obsessed, too lacking in vision, self-discipline or whatever. 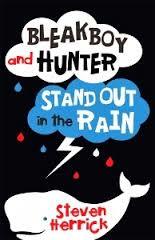 Steven Herrick’s latest novel “Bleakboy and Hunter Stand Out in the Rain,” challenges these perspectives. Instead, he chooses to present his audience with a world in which a handful of eleven-year-old kids, Hunter, Jesse and Kate, remind us of how awe-inspiringly brilliant young people can be. Jesse, the new boy, struggles to fit into his alternative school whilst trying to come to terms with the even bigger issues of World Hunger and Poverty. When he meets Kate, he realises that he is not alone in his concerns and together they set about ‘Saving the Whales’. However, in the meantime they must deal with Hunter, the school bully, whose systematic torture of them conceals his own very real pain. Despite being officially labelled as “Children’s Fiction” this is a story that will be well received by students in later primary years and in the early years of high school. It is the kind of middle grade fiction that is so well written that teens will forgive the fact that the protagonists are only 11. It helps that Herrick refuses to dumb things down with inane humour, and likewise develops characters that are in no way babyish. “Bleakboy” explores a range of themes pertinent for this audience; including the impact and origin of bullying, the global issues facing humanity and the environment, the development of an individual belief system, alongside the impact of family breakdown upon young people. A detailed investigation of this text would be effectively complemented with an exploration of protest song lyrics (Midnight Oil’s Beds are Burning, Pink’s Mr President, Bob Dylan’s Times They are a Changin). Students will no doubt appreciate the emerging discussions upon key themes that might culminate in class debates, action research tasks or expository writing. This is a tale of sparkling optimism. Herrick, as always, demonstrates masterful control of prose and develops each character skilfully so that they stay with the reader long after the book is finished.